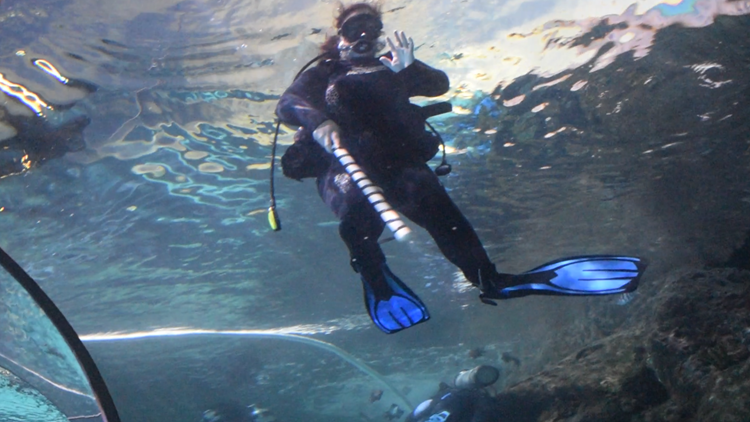 What's it like to work at the Ripley's Aquarium? 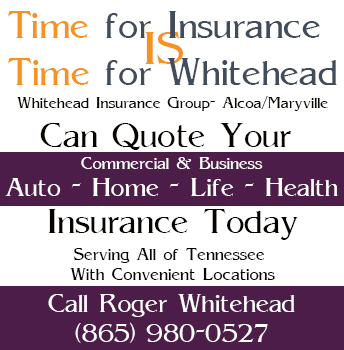 GATLINBURG, Tenn. — Working at the Ripley’s Aquarium of the Smokies isn’t all shark cruises, penguin feedings and scuba diving. Those are definitely aspects of the job that visitors see, but there is far more beneath the surface and behind the scenes. The animal care staff arrives at 7 a.m. ready to hit the ground running, according to Jared Durrett, the assistant director of husbandry. 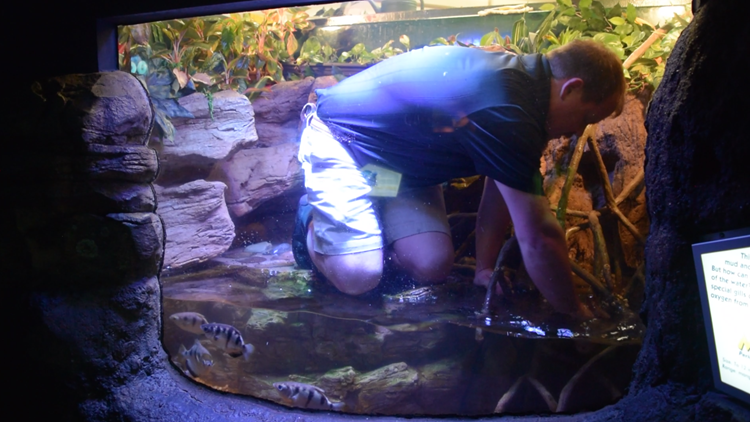 The aquarium doors open at 9 a.m. so they have two hours to take water samples, do morning feedings, perform routine maintenance and clean the exhibits before the first guests arrive. Everyone is assigned to their own zone with their own tasks. While some are feeding jellyfish with a baster or filtering the gravel in the peek-a-boo tanks, others are tossing prepared fish to the reef sharks or diving into Ray Bay to scrub the enclosure. 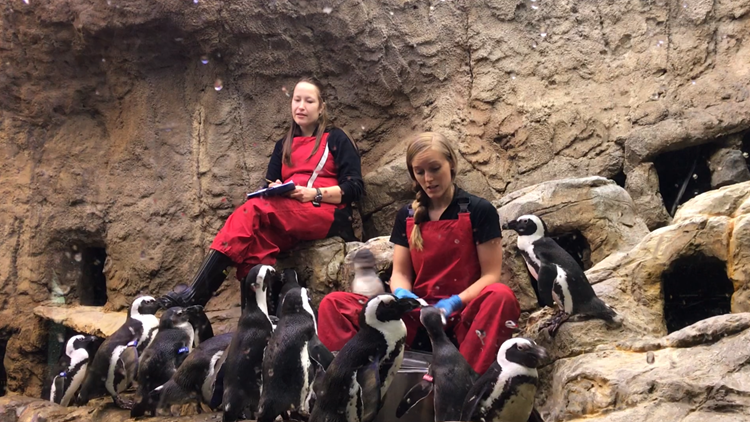 This is also when staff members powerwash the penguin exhibit. They just have to watch their step while they work because their flightless supervisors have a tendency to get underfoot. Durrett said one major point of pride is keeping the glass clean, but all of these steps are crucial for animal welfare and visitor experience. Once the doors open, the work does not stop. Some of the staff moves on to meal prepping, which involves everything from taking care of the live feed to cleaning pounds of fish to slicing up fresh fruit. Each exhibit has its own needs so each one has a bucket with a recipe card so nothing is left out. 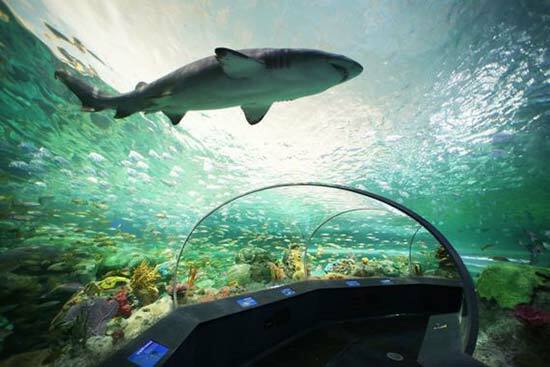 Other staff members suit up and dive into Shark Lagoon to clean it, waving at guests as they walk through the viewing tunnels or ride overhead in the glass-bottomed boat. Tip: If you want to spot Sally the sea turtle, go to the aquarium in the morning while the divers are cleaning Shark Lagoon. She likes to play and often hangs out near them. Around noon, it’s time to feed the penguins and the sharks. While guests enjoy the spectacle, the staff is calling out crucial data to each other to make sure every animal gets the nutrition it needs. 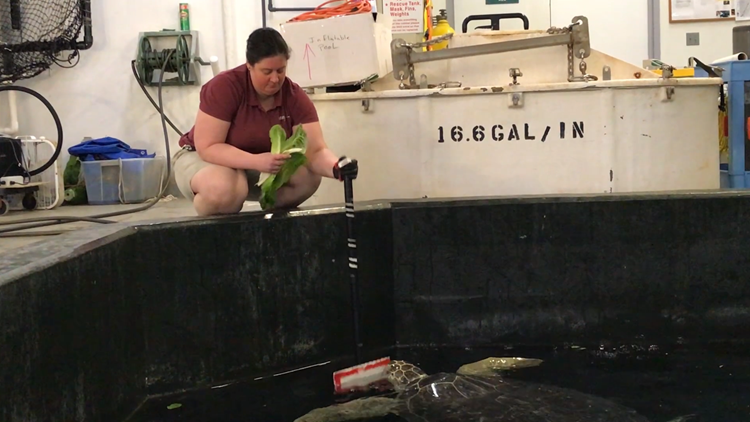 Behind the scenes, a couple of staff members bring Sally the sea turtle to the back to train her and feed her separately from the sharks. Recently, they created a mock reef to add more habitat to the pufferfish exhibit, working a couple of days per week for a few weeks until it was ready. 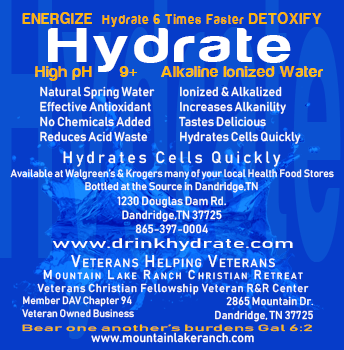 Durrett also stressed operations were not entirely up to the animal care staff. Anyone in other departments that notices something that isn’t quite right will speak up. Specifically, he called the life support department the “unsung heroes” of the aquarium because they are responsible for keeping the exhibits healthy and maintaining the man-made seawater since Gatlinburg is nowhere near the coast.